Happy World Fair Trade Day from Fair World Project! | Small Farmers. Big Change. « Happy World Fair Trade Day from our Banana Team! Happy World Fair Trade Day from Fair World Project! 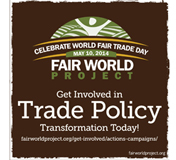 Celebrate World Fair Trade Day By Taking Action! Make a choice and enter to win! Watch five short videos from the finalists in our World Fair Trade Day video contest. We asked all of you to submit videos on why you should win a chance to go to Nicaragua to see fair trade on the ground and what you would bring back to your community. We reviewed dozens of great videos and chose five finalists who represent different ideas about fair trade and how to move it forward. 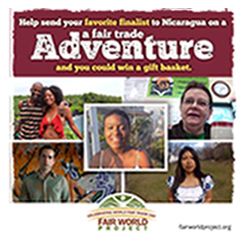 Everyone who votes is entered to win a fair trade gift basket worth $150 for themselves! Vote now and enter to win! Support Fair Brands! And even better, support fair brands giving you a discount on select fair trade products at a natural food store or co-op near you! Spread the word! Watch our own Free Trade vs. Fair Trade video and share it with your network. Advocate for fair policies! As important as it is to support small-scale farmers and mission-driven brands, we will never have the impact we want until our policies are in line with our values. Take a look at our action and campaign page where we make it easy to tell congress you want fair trade not free trade, advocate for a fair minimum wage, and advocate on behalf of small-scale farmers in Brazil and victims of the Rana Plaza disaster in Banglaesh. Ethtix Merch interview with Jonathan Rosenthal on his keynote speech at Fair Trade Federation conference, history of fair trade, direct trade, and more. Watch the trailer for Seed Keeper of Crescentville, a book that portrays where communities may be heading as corporations take over food and see supply. After long debate, Vermont becomes first state to require GMO labeling with no strings attached. Fair World Project joined other civil society organizations in a letter to Harvard University to express concern over their troubling investments in farmland, forests, and other natural resources around the world.